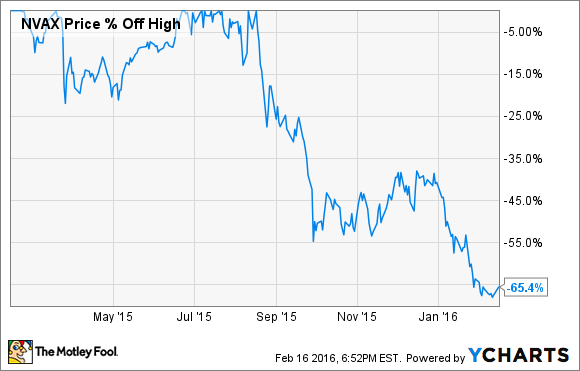 Looking to go dumpster-diving for stocks on sale? Read on. Investors can be a moody and shortsighted bunch. A company mildly disappoints on some near-term metric and they abandon its long-term story by selling off its shares. That said, patient long-term investors actually stand to benefit from this moodiness because they can pick up shares of a great long-term story at a pretty hefty discount. That's exactly what we see in three companies currently trading right around their 52-week lows. While all three have some near-term obstacles to overcome, as the longer-term stories play out it could drive strong outperformance for investors picking up shares at these low prices. All hope isn't lost, however. The clinical program for Novavax's experimental RSV vaccine is progressing nicely for the most part, especially in its trials for the elderly. Moreover, this senior note offering -- along with an $89 million grant from the Gates Foundation for the vaccine's upcoming late-stage trial in pregnant women -- should allow the biotech to complete the vaccine's late-stage testing without further diluting shareholders. The bottom line is that Novavax's developmental-stage RSV vaccine is still a viable megablockbuster product candidate due to the huge unmet medical needs across all of its indications, and the potential for it to be recommended for nearly every senior citizen in the U.S., if approved. So, while this stock will probably remain volatile for the time being, patient investors looking for unusual growth opportunities may want to pick up some shares in this promising company before the market's pessimism toward biotech as a whole starts to fade. I pounded the table last month for Buffalo Wild Wings (NASDAQ:BWLD), arguing its stock was too cheap to ignore ahead of its fourth-quarter 2015 report. Unfortunately, shares of the wings, beer, and sports-centric restaurant chain drifted lower to touch a fresh 52-week-low shortly after posting those largely solid results, which admittedly featured modest same-store sales growth (1.9% and 0.1% at company-owned and franchised locations, respectively) that fell short of management's expectations. At the same time, CEO Sally Smith pointed out that those numbers continued to outpace those of the casual-dining industry as a whole, demonstrating the relative effectiveness of Buffalo Wild Wings' strategy of keeping consumers coming back for more despite current market headwinds. Meanwhile, Buffalo Wild Wings managed to reaccelerate earnings growth (with net income per share up 23.4% year over year) through its ability to leverage both food and labor costs as a percentage of total sales, as well as selective share repurchases during the quarter. But things are even more exciting looking forward. Buffalo Wild Wings expects full-year 2016 earnings growth of 20% to 25%, driven by single-digit same-store sales growth, $100 million in share repurchases, and 45 to 50 new company-owned B-Dubs restaurants, 30 to 35 new domestic franchises, 12 to 15 international franchises, and new locations for both its R Taco and PizzaRev fast-casual concepts. Subsequent to the end of the quarter, Buffalo Wild Wings also elaborated on the latter by setting a new growth plan for its R Taco chain -- which currently has 11 locations in two cities -- to introduce both company-owned and franchised R Taco locations in seven new cities: Omaha, Nebraska; Austin and San Antonio, Texas; Oklahoma City and Tulsa, Oklahoma; St. Louis, Missouri; and Des Moines, Iowa. Zooming out to view this through a longer-term lens, astute investors will realize we're witnessing the early stages of a more aggressive push to fulfill Buffalo Wild Wings' goal of nearly tripling its diversified restaurant unit base to around 3,000 locations worldwide. With shares currently sitting near 52-week-lows, I think now is a great time for patient investors to open or add to a position in Buffalo Wild Wings. While the dividend reduction is certainly a blow to the company's credibility, it is the right action to take because the company really couldn't justify heavy borrowing just to meet this commitment to shareholders. Instead, the company has chosen to preserve its balance sheet strength in order to have the financial flexibility to capture opportunities that lie ahead. The biggest opportunity is the eventual rebound in the price of oil. While it's anyone's guess when that will happen, the fact that few oil companies have the financial means to even maintain their oil production this year suggests that oil needs to rebound sharply before supplies can be maintained, let alone meet growing demand. 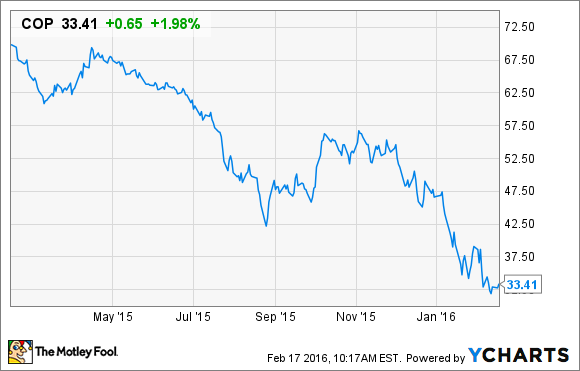 It's that catalyst that could make ConocoPhillips a long-term winner from its current lows.